The Biblical World: Between a Rock and a Hard Place: Neither Liberal Nor Conservative? 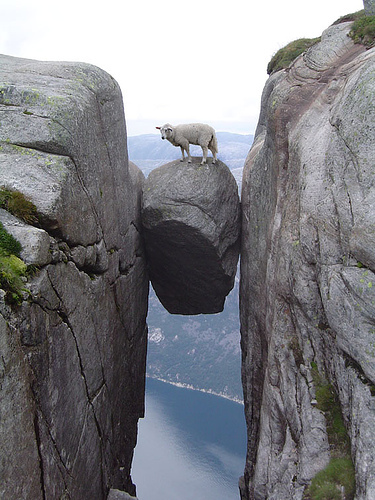 Between a Rock and a Hard Place: Neither Liberal Nor Conservative? The last week has seen a flurry of stories about the decline of liberal Christianity. Some of the recent decisions of the Episcopal Church (and not just the ones related to sexuality) seem to have neutered what was left of a once strong arm of Christianity in the USA. The biggest irony of the week was that the church is selling its Manhattan headquarters because it can't afford it. At the same time, the church has spent $18 million dollars suing breakaway congregations in an effort to force those congregations to return the "church's" property. Now the Episcopal church is the owner of numerous empty buildings, none of which it can afford. My point here is not to critique or pick a fight with the Episcopal church. I was baptized and confirmed in the Episcopal church. And although I have not attended an Episcopal church for years (for reasons not related to the present controversies), there is a part of me that still identifies with that church. But what got me thinking was the articles declaring the end of liberal Christianity. Ross Douthat of the New York Times asked Can Liberal Christianity be Saved? He is less than optimistic. Responding on the Huffiington Post was Diana Butler who reminded Douthat that conservative Christianity wasn't doing so well either. Her question is Can Christianity be Saved? Wading into the middle is Rachel Held Evans who looked at both sides of the issue and declared that she doesn't want to pick sides. She rightly points out that missing from both articles is the fact that we are both in this together. I want to echo some of Rachel's sentiment and ask my readers to chime in. I really do hate the whole culture of labels. I realize that some labels are necessary and helpful. But quite often they are used to tag, demonize and or marginalize. They are a convenient way of summing up everything about someone or some group in one word. Of course, when was one word ever enough to describe anyone? Calling someone a liberal Democrat or conservative Republican fails to consider that as individuals such labels really don't describe what a person believes about policy issues. It's possible to have a Republican who is pro-abortion and anti-healthcare or a Democrat who wants prayer in school and higher taxes on the rich. I find the use of labels troubling in Christianity as well. As a biblical scholar I find that I rarely "fit-in" in any group. When I am around more "conservative minded people" I feel like I am a "liberal" who is always rocking the boat and causing trouble. I wonder sometimes who people can be so myopic and they look at me as if to say "heretic!". But when I am around more "liberal Christians" I feel like the a fundamentalist in the chicken coop. I hear some of what they say and I wonder if they have thrown the baby out with the bath water. They look at me with eyes that seem to say "ah, an another unenlightened fool." And of course people always want you to give yourself a label: "What are you?" "How would you define yourself?" "Who do you support?" And I always find it difficult to answer. The easiest label to reach for is that of "moderate," but that sounds more like a glass of lukewarm water, useful to no one. I sometimes say "I don't use labels" which means that I am labeled as a closet liberal or conservative depending on who I am talking to. Part of the problem is that so many of the issues that divide people do so because they are so complicated and arose so much passion. They usually can't be solved easily with a "liberal" or conservative" label and once you dig in deeper the less inclined you are to use those labels. So much in life, theology and politics just isn't that easy. In the end I have yet to find a solution. I move between various groups feeling like I am a secret agent from the opposing team. And what I really want is to just be able to exist and dialog without having to "take a stand" in such a way that I "fit in." What about you? What labels do you accept and reject? How have you navigated this path? The tragedy is that so called liberals and conservatives rarely share a congregation (let alone a denomination). Christians need to understand the idea that we are to be the body of Christ together, not because we agree about biblical interpretation/politics/music style but because we are sinners reconciled to God and each other in Christ. Our unity is in Christ NOT in our unity with each other. The trouble is that finding the right congregation and denomination for you is inherent in American DNA thanks to the Reformation and America's individualistic consumer society. John - just rejoice that you are too liberal and too conservative depending on who you are hanging out with -- it means that you are still hanging out in the Church. If we go by labels, my church might be considered a "Liberal Church".. However, that "label" does not fit "me". Though my church is progressive in some issues of the day (Gay marriage, etc), I find that it can be a little too liberal for me in regards to other current issues. Do people use labels to describe churches or even people? of course they do. Could it be considered a form of stereotyping? perhaps. Is there a way to prevent "labeling"? doubtful. You ask, "what labels do you accept and reject?" Tough call. If you were to ask me my political beliefs/label, I would most likely respond that I am a DINO (democrat in name only - all of my ideals, save three, are associated w/ the Republican Ticket). Regarding my religion, I would simply answer, Christian. Not Liberal Christian, not Conservative Christian. I might follow-up with, "I believe in the teachings of Christ." I think we are all labeled by others on a daily basis.. whether it be our sexual orientation, our ethnicity, our gender, our political affiliation, etc etc. When we label someone (or something) perhaps we judging them (it) to a certain extent? Just a thought. John - I know how you feel. Have you ever read Alisdair McIntyre's "After Virtue"? He gets at this question/issue (the interminability of these social/political arguments) in an insightful and compelling way. Just a thought...picking sides and taking a stand are two different things. But that thought aside, you could use the answers I provide. When I'm asked where I stand my first response is always "orthodox" (Not Eastern Orthodox!) as I affirm the faith of the historic creeds and confessions. If I'm pressed further I say "I'm a sinner saved by Christ, what more is there?" That usually ends the discussion. As a liberal, someone who wants to call "Christian" whatever he happens to wish to believe, I'm sure it is deeply confusing to you. It is not nearly so confusing to anyone else. Ok, I am confused now. Are you calling me a liberal who labels "Christian" whatever I wish? If not, can you please clarify. If not, can you please specify? The important part of this anonymous post is the last sentence: "its not nearly so confusing to ANYONE else" (emphasis mine). This means that our anonymous Brother in Christ felt it safe to assume that you are more confused about this particular matter than everyone else in existence. Surely someone with enough unbridled self confidence to make such presumptuous accusations must be someone who approaches the task of theology with a heart that is humble, honest, and open to the Lord's instruction. In actuality, we should all find joy and comfort in the fact that the God we serve is far too complex for anyone to fully comprehend--particularly those of us who think we've got our theology figured out. I accept Christian and even 'Bible-basher' - depending on who it is coming from. Not everyone understands or respects Christians so I see my role as being magnanimous and fully present and to address other's labels when it seems they could be open-minded enough to change them. In fact, I see it as more of my role to understand the other person. Recently I was amazed to be talking to a 'seeking' person who was giving me a defence of Satanism 'it's about putting yourself first'. I challened this gently but what amazed me hugely was here was this guy asking geunine questions of the kind I have never heard people as in church. I was amazed and humbled...and if I had labelled him, or myself I think that would have totally shut down the situation. When Adam named the animals, those names were undoubtedly useful later as he might have said to Eve, "have you seen the hippopotamus today?" and she might say, "yes, he's down by the river as always." But this conversation is not about names - it's about labels human beings use upon other human beings. And since the time of the Fall we use labels upon one another primarily to distinguish who is like us and who isn't - who is "in" and who is "out." There are times when Christians need to be discriminating as we talk about others who seem to be like us but really aren't (see Mitzi Smith's recent book "The Literary Construction of the Other in the Acts of the Apostles" for examples). But when the hand says to the eye "because you're not a hand, you're not part of the body" (to paraphrase St. Paul) then we do a great deal of disservice to hand, to eye, and to body all at once. Much better, I think, to ask how our differences can come together to serve the Body than to ask how they keep us apart. I feel exactly like this. Not just between the lib/con names, the Prot/Catholic as well. I admire Thomas Aquinas and Karl Barth. I want us to be what Jesus prayed for, one as He and the Father are one. I love good theological discussions, but, want to focus on unity moreso in Christ. The Hebrew Bible in 5 Minutes.